The team won the NWAC championship in 1979 and has earned seven league titles (most recent in 2018) and five top four finishes (most recent in 2018). Sophomore outside hitter Michelle Dmitruk (Everett, Wash.) has been named to the American Volleyball Coaches Association's Two-Year College All-American team. 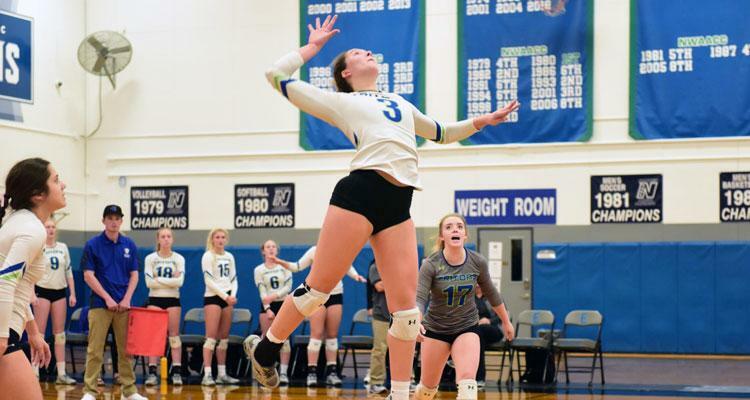 Dmitruk, who was tabbed as the NWAC North Region MVP, and who was also selected to the NWAC All-Tournament Team, landed on the AVCA Third-Team All-American list. Dmitruk led the Tritons to the North Region title and a 4th place finish at the NWAC Tournament. She averaged the most kills per set in the region. Dmitruk also received the NWAC Academic Excellence Award for her efforts in the classroom. Michelle Dmitruk, a Cascade High School alumna, didn't take a traditional path to success. Dmitruk, a 5-foot-10 sophomore, is the top player for an Edmonds team that is 29-6, went undefeated in the North Region, and carries the No. 4 ranking in the NWAC coaches poll into the NWAC tournament, which takes place Thursday through Sunday at the Greater Tacoma Convention Center. The Tritons open the double-elimination tournament against West Region No. 4 Tacoma at 2 p.m. Thursday. Michelle Dmitruk was bestowed the honor of NWAC Volleyball Offensive Player of the Week on October 25. The sophomore outside hitter from Cascade High School was very efficient hitting, had solid passing despite being targeted by both of the Tritons' opponents, and also played stellar defense. Against Shoreline (Oct. 15) and Olympic (Oct. 17) she also added five aces. 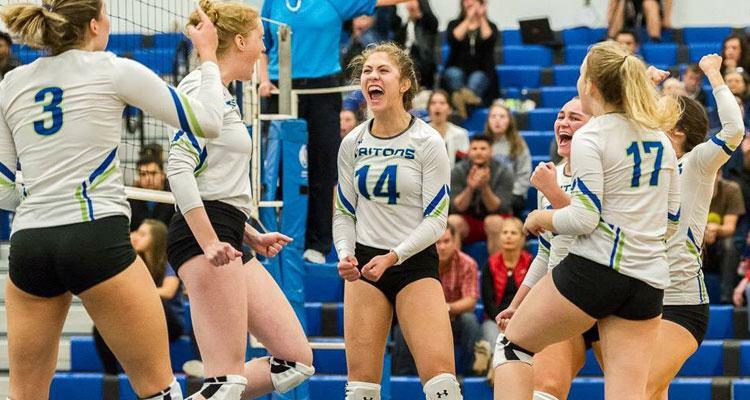 Edmonds CC volleyball ripped off their seventh win in a row on Friday, September 21 when they topped Shoreline CC in straight sets (25-18, 25-23, 25-19) to open NWAC North Region play. Michelle Dmitruk led the attack with 17 kills; Sadie Gardner added 15 kills. Four Tritons recorded double digit digs: Emalee Jordan (15), Gardner (14), Heather Goodman (12), Dmitruk (10). 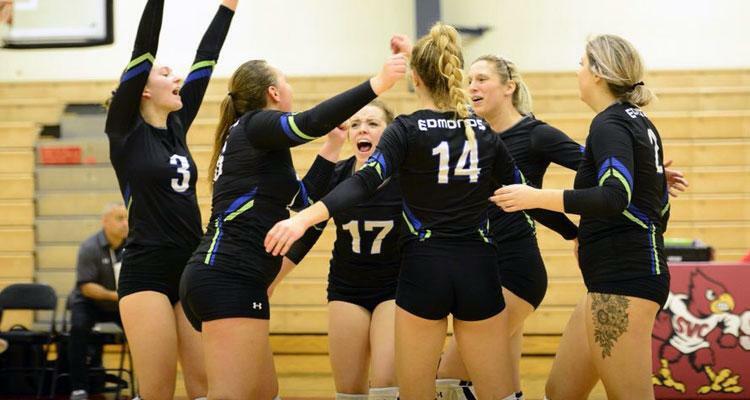 Edmonds (18-6) earned five wins to stay perfect at the NWAC Crossover Tournament in Gresham, Ore. September 14-15. The Tritons took the Championship, which was hosted by Mt. Hood CC. Sophomore outside hitter Michelle Dmitruk was named the Tournament MVP. Emalee Jordan (Meridian, Idaho), Sadie Gardner (Vernal, Utah), and Haylee Hooper (Auburn, Wash.), also garnered recognition as they were named to the All-Tournament Team (pictured left-to-right). Sophomore Sydnee Peterson was selected as the NWAC defensive Player of the Week on September 12. It is the second time the libero has been honored this season. On September 6, she was named as the North Region defensive player of the week. She also received that regional award this week. Peterson hails from Draper, Utah, and has been a key cog for the Tritons' successful start in the 2018 campaign. Her 4.48 digs per set are third best overall in the NWAC. 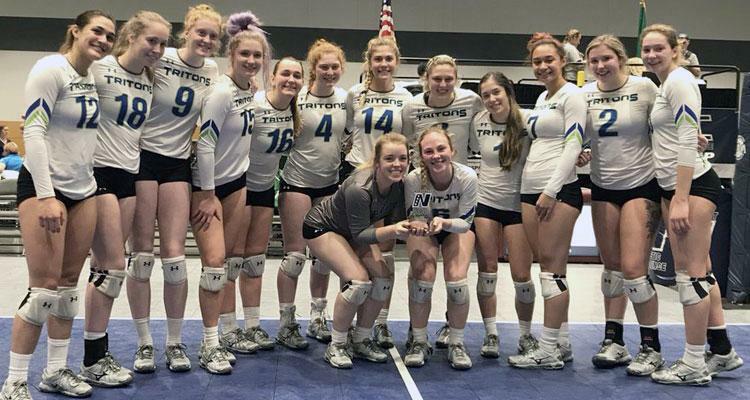 The Edmonds Community College volleyball team opens the 2017 NWAC Volleyball Championships bright and early Thursday morning on the fifth floor of the Tacoma Convention Center. The Tritons are pitted against the Walla Walla Community College Warriors at 9 a.m. in their opening round game.